Landscapes are key to our understanding of Australian art. 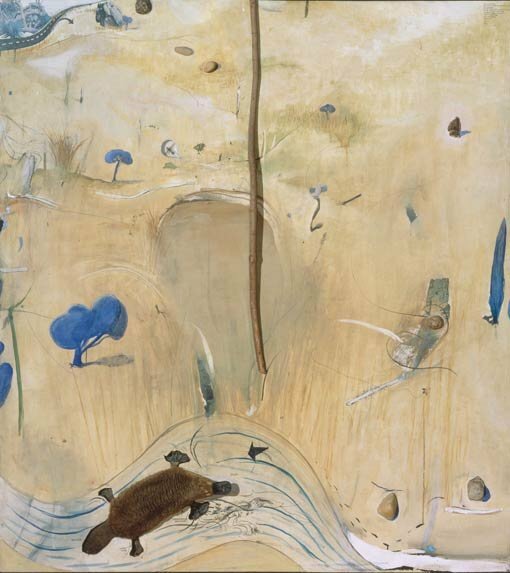 Brett Whiteley immersed himself in both urban and rural landscapes from his early years, and it was a constant theme throughout his artistic practice, whether in intimate studies or large poetic paintings. Whiteley’s works combine elements of abstraction and realism in a lyrical and expressive manner. He fused an Asian aesthetic of perspective with a European sensibility to create a unique floating sensual landscape, with birds, nests, trees, rocks and rivers inhabiting a world founded on place and set in imagination and feeling. Whiteley redefined the way we see the Australian landscape, becoming one of our most celebrated 20th-century painters with his interpretations and moods of the countryside.